On Saturday, we celebrated The Engineer’s Baby’s first birthday in Penang. We got up nice and early, and opened some Penang presents. She visited a soft play in the mall while we took turns for coffee and shopping. We came back to our resort for a nice long nap. She ate some lunch (although she threw most of it into the sea before we could save it). 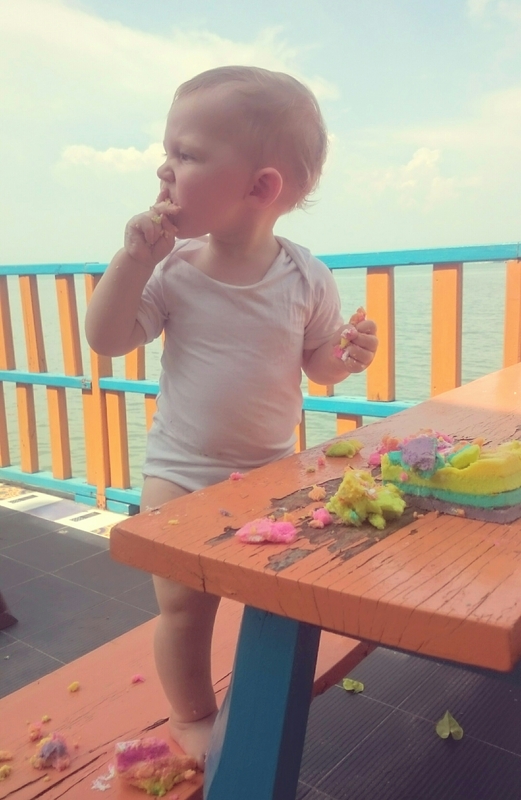 We had some cake, which she mostly smashed. We went for a swim and an explore. She found a box of tissues and emptied them all over our room. And we finished off with a sushi picnic at that same orange table. All in all, it was a lovely way to finish her first year. A couple of days later, we are home again. And I still don’t really know what to say or what to feel. It’s overwhelming to think that the first year is truly done and dusted. It’s crazy to think she’s a toddler (officially, she will obviously always be our baby). It’s lovely to look back and see how much she’s grown. It’s sad to think we might not get to do it all again. It’s exciting to see how much she is learning. I have a natural desire to figure things out, to craft a story and decide what it all means. But if there’s anything that this year has taught me, it’s that figuring out is impossible, and not particularly useful in many situations. So instead of dwelling on this first birthday and trying to say something profound, I’m enjoying this awesome kid. And planning her party. And recovering from the whirlwind that is a holiday with a baby/toddler/kid. Happy birthday, baby, and here’s to many more!